I would say that gin is having a moment, but it’s actually having a couple of centuries. Since the Gin Craze first washed over London in the 1700s to the current wave of citrus, spice and barreled gins, this wild herbaceous spirit has shown its resilience through Prohibition, the rise of vodka, and a few whiskey revivals. It’s not going anywhere. One of the best things about gin is there are no rules as to how it is supposed to taste—and therefore, no rules on how you can drink it. Juniper, the dominant botanical flavor in the London Dry Style (think Tanqueray, Gordon’s, & co.), accounts for that “piney” element we all remember from our young drinking days. While there’s nothing quite like a dry G&T to make you feel like you’re attending the regatta with Biff and Muffy, there are quite a few gins that bring other flavors to the fore. Here are seven gins that are so velvety and nuanced that you will want to enjoy them just as they are, or with a little ice for those hot boating days. Caledonia Spirits’ flagship and barrel-aged gins are both delicious and distinct enough that it was impossible to decide between them. Barr Hill’s distinguishing ingredient is their signature raw honey, represented by the bee logo, and this rustic sweetness comes through both in the flavor and the texture of the gins. Barr Hill starts out grassy, is sweet throughout, with finishes with light caramel and sea salt. The Tom Cat has a more robust herbal profile with a huge dose of florals and prominent juniper, but its aging in new American oak softens the edges with vanilla and spice and makes this drink like a perfumed whiskey. Another great American farm distillery, Peak Spirits operates in Colorado orchard country and produces booze made from organic and bio-dynamically grown produce. Cap Rock’s spirit base comes from Jonathan apples and wheat. The apple base brings a silky sweet note throughout the palate. Florals dominate over juniper here, and they bring a surprisingly nice sense of drinking rosewater. Any lingering sharpness is not enough to detract from the pleasant fruity/floral thing. Aging in oak barrels is a point of contention among many gin drinkers: can we have brown gin? The patron saint of liquor history David Wondrich says yes, and in 2008, France’s Citadelle made their first “réserve”, which also responded clearly in the affirmative. Citadelle’s un-aged gin, to start with, has intense spice notes and florals along with a strong juniper “bite,” and the reserve spends months in French oak barrels to remove its teeth and some round vanilla notes. The 2012 vintage incorporates genepi (think Chartreuse) and other new botanicals to the Citadelle base recipe, along with a six-month rest in lightly charred barrels. The result is sweet, viscous and complex. Before those comment-fingers get to typing: we are fully aware that genever and gin are considered two different spirits. But genever is gin’s predecessor and deserves some neat-sipping love, nonetheless. It was the Dutch who first started infusing their neutral base spirit with medicinal juniper to make this herbaceous liquor and the English who thought that was such a good idea they had to co-opt it and give it a new name. The base spirit for genever is malt wine and not grain alcohol, which gives it that pleasantly malty flavor and velvety texture. By the Dutch Genever is a relatively new player in the American market and its malty base brings to mind—in the very best way—breakfast cereal. Add to that a spice-heavy botanical blend and you wind up with a spirit to drink straight, in front of the fireplace with after-dinner gouda and fruits. San Francisco’s Distillery No. 209 makes a range of barreled versions of their flagship gin, which is a hard-biting botanical bomb in a tall clear bottle. Their “reserve” line (by law, gins are not allowed to be labeled “barrel-aged”) uses refill wine casks from their sister-winery in Napa Valley—a different varietal each year. The Chardonnay reserve is aged for four months, and it carries a wonderful buttery quality from its barrels’ former occupants, with muted butterscotch and toffee notes from the oak. The herb-and-coriander heavy base gin comes through strong, but not enough to wince over. If we are talking about easy-drinking gins, we have to talk about Old Tom. Traditionally sweeter and viscous than its London Dry cousins, this style can serve as an entry point for gin-haters into the juniper club. Jensen’s, while not containing added sugars, comes through sweet and soft, with a delightful variety of aromas including dill, coriander, anise and honey. Worth a try with your bitter tonic, sure, but also definitely a nip on its own. 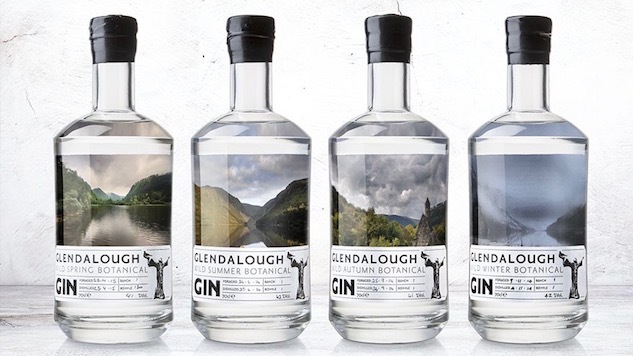 Ireland’s Glendalough (glenda-lock) Distillery makes a huge deal out of their foraged botanicals, and rightly so. This one is a neat-sipper for advanced gin drinkers; a botanical puzzle with myriad flavors to parse. The payoff here is the unusual aroma stew that comes from infusing with fresh, wild, local produce: a clean, anise-y base that gives way to a profusion of flowers, woody herbs, bitters, and spices that can come off medicinal if you’re not paying attention. So, committed are these producers to locavore ethos that until recently they only produced seasonal versions of their gins, which are worth checking out on their own. However, the All Season Gin is a bottle you can keep around to fill up your flask during rugby, football, hurling or—sure—yachting seasons.